For a safe trek to Damavand peak, it is necessary to bring the proper gears. Even in summer season have suitable equipment to protect yourself in case of bad weather and emergency. Depending to the weather forecast on the summit day, you can decide which gears you need to take with you and which unnecessary equipment to leave behind at last camp (camp 3 Bargah Sevom). Some of the most important things to bring are listed below. Visit also Damavand Winter Gears. When you apply for a tour, some gears are provided by your tour operator. Just bring your personal equipment. – Earplug, to block undesirable noises which may disrupt your sleep in shelter/hut. – Warm Jacket and pants (rain/snow/wind). – Main backpack (plus a small summit (attacking) backpack). – Ski or trekking poles (stick). – Hat, warm pile/wool hat (better to cover ears), balaclava, baseball cap, scarf. – Glacier/Sun glasses with Side Covers 100% UV, IR. – Sunscreen cream SPF 40 or better. – Small personal first-aid kit. – Sleeping bag (bring lining). – Trekking shoes and Socks. – Sleeping bag, mattress, tent. – Jacket and pants (Gore-Tex or Synthetic rain/snow/wind). – Main backpack plus a small attacking (summit) backpack. – Gloves (Polar or Wool with liner). – Hat, warm pile/wool hat (should cover ears), balaclava, baseball cap, scarf. – Water Bottles (and Purification tablets). How to climb Mount Damavand Iran. 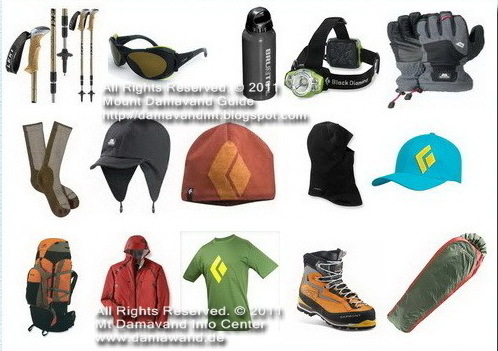 Equipment and gear list for trekking Damavand Iran. Mt Damavand Elevation by GPS. Common mistakes in trekking Damawand Mountain. Routes and tracks to Mount Damavand peak. Damavand Mountain difficulty and climbing grade. Mt. Damawand Iran facts and figures. Damavand climbing season and timing. 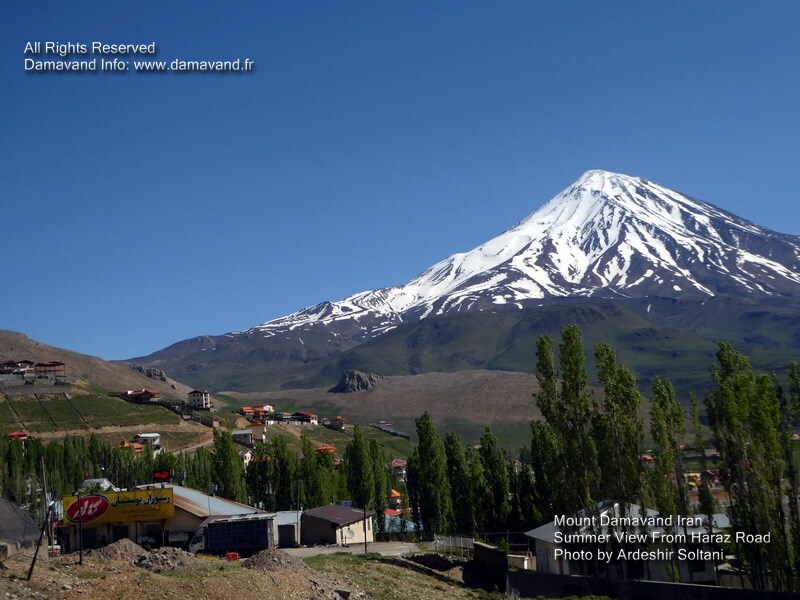 Damavand weather forecast and meteo. Natural attraction of Mount Damawand Iran.